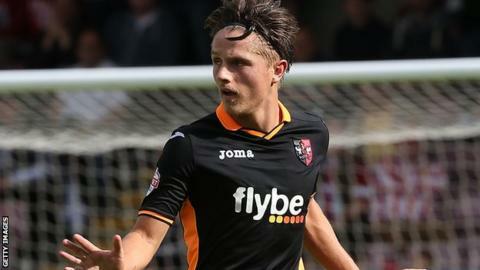 Exeter City striker Tom Nichols says he is enjoying the competition for places up front at the League Two club. Nichols, 22, scored twice in Exeter's 4-0 win over Leyton Orient, taking his tally to three goals in six games. Despite summer signings such as Will Hoskins and Joel Grant, the academy graduate has started all but one of Exeter's League Two matches. "Competition is good, training's good at the moment and we're all pushing for a starting place," he told BBC Sport. "There's plenty of players. We could have a couple of injuries and still have more than we had last year. "It keeps you on your toes and once we're all fit I'm sure it's a bit of a headache for (manager) Paul Tisdale who to pick." All three of Nichols' goals have come from the penalty spot, but despite having yet to score from open play, he says the goals have lifted his spirits. "This time last year I was on one goal and I ended up finishing with quite a lot of goals," he said. "It does a lot for you on a personal level, it relaxes you a bit because that's what strikers are there for, so it does relax you and help you to play better."